A friend had recently recommended Lulu’s in the Grove so I decided to check it out. The restaurant is located directly across the street from Greenstreet Café and is actually owned by the same owner. The outside of the restaurant seems cozy, with big red couches strewed around the corner with citronella tiki lights to ward off pesky mosquitoes. I decided to go inside because the heat that day was only bearable by Canadian tourists and hairless cats. The space inside the actual restaurant is very small and the majority of the sitting space lies outside on the side walk. 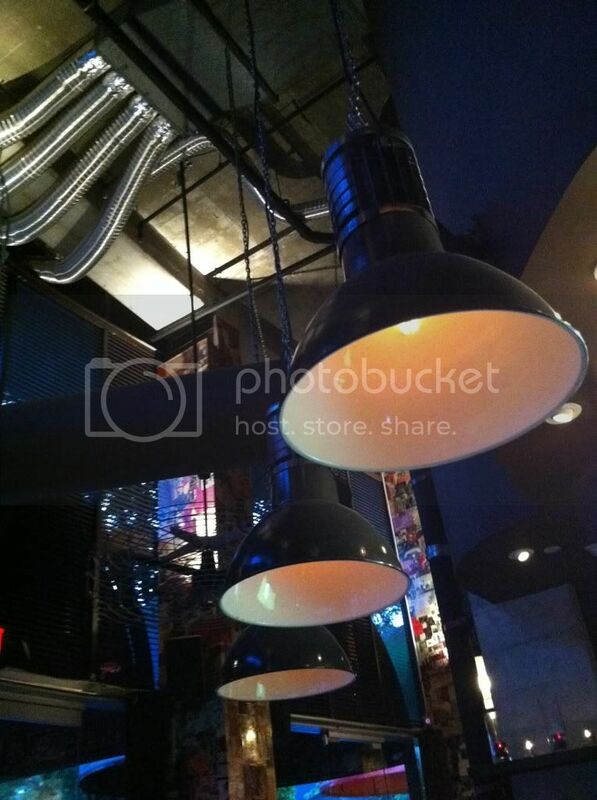 The inside of the restaurant looks very industrial with exposed pipes in the ceiling and the color scheme sticking to black, white and red. There are also collages throughout some of the walls with pictures and newspaper cut outs that draw your attention. I decided to sit at the bar where I met the bartender, Megan, who was very funny and jovial. Their menu offers a big selection of small plates/appetizers so I decided to try one of those out. The one that popped out at me was the shichimi corn. 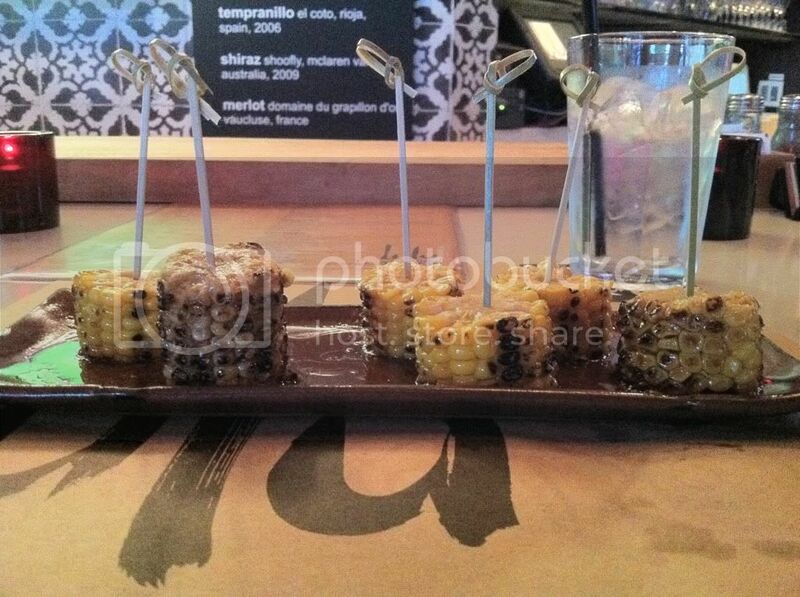 The shichimi corn is simply put, skewered corn (fancy way of saying corn on the cob) with butter garlic shichimi. 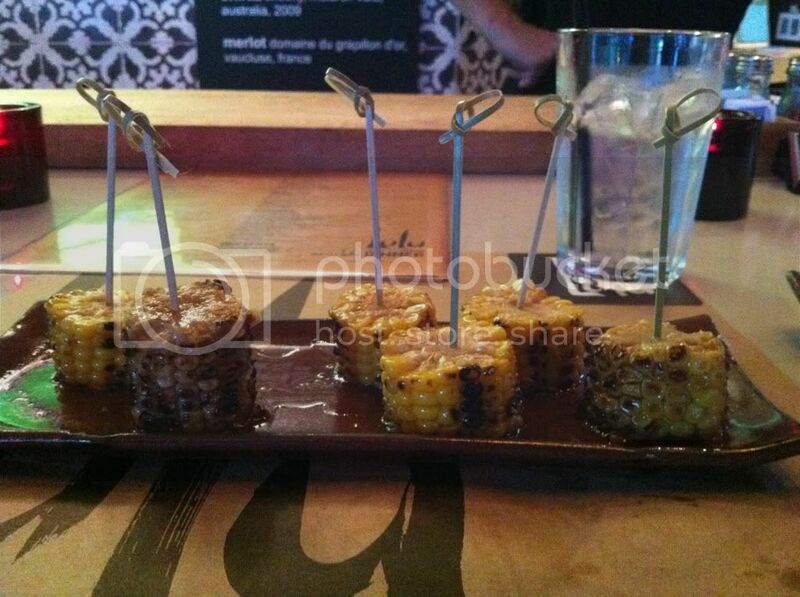 Thankfully, the corn came out in small manageable pieces that didn’t require me rolling up my sleeves. The corn was well grilled and the shichimi gave the corn a slight and subtle heat, but it didn’t take away from the flavor of the corn. The corn's flavor definitely shined through but was only tweaked by the slight seasoning and spice from the shichimi. It was really good and it left me curious to see what else they had to offer. 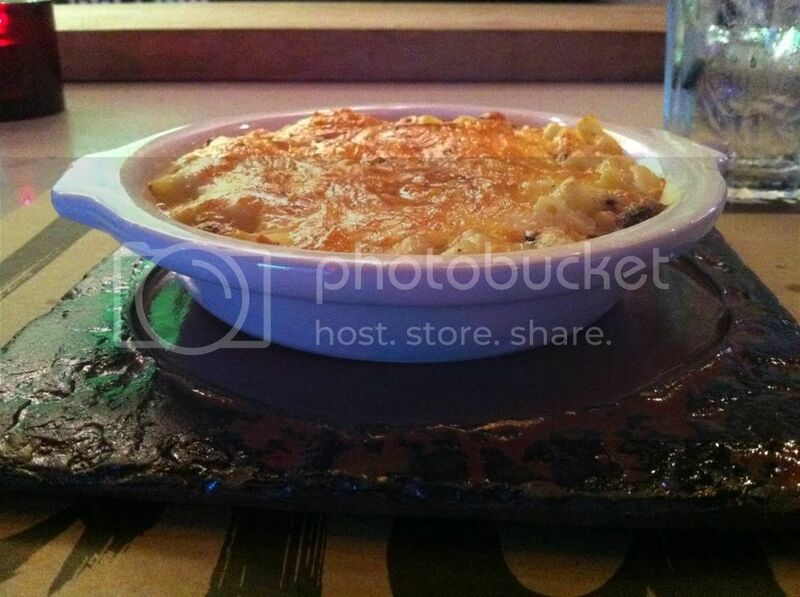 Up next, I went with the Truffled Mac and Cheese. The dish came out boiling hot with some of the cheese still sizzling around the edge; this was of course a very good sign. 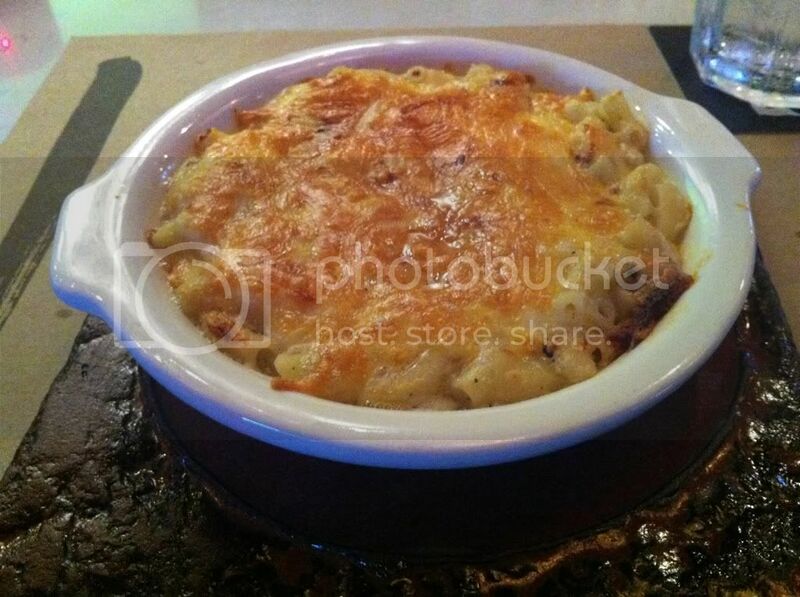 The parmesan cheese over the top was light browned and once you dug in, a cloud of steam poofed out from the dish. 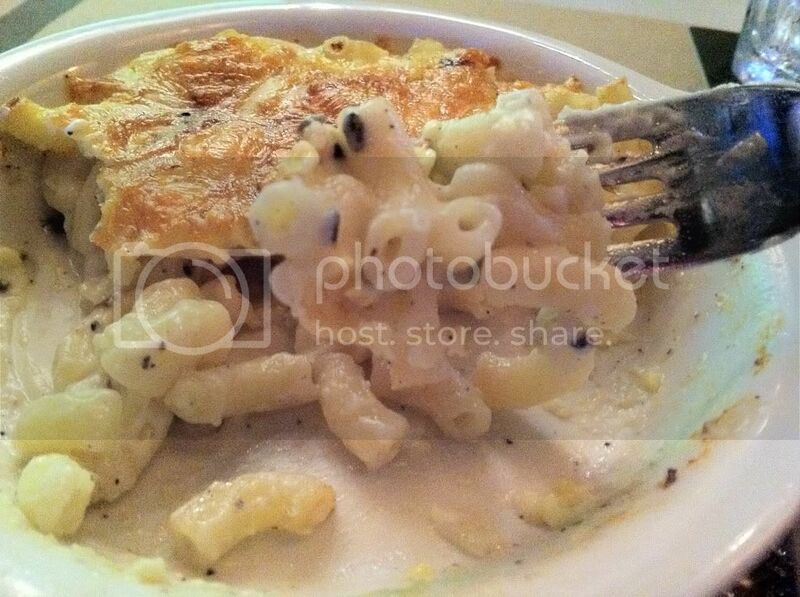 The béchamel and cheese sauce had bits of truffle and once you bit into the pasta you got a tiny hint of truffle oil. It was just enough to uplift the flavor but definitely not enough to overpower the pasta and cheese. The flavor was nothing short of magical and as I inhaled it, Megan came over and said, “It’s good huh? I don’t know how I haven’t gained 10 lbs on that stuff.” The truth is I don’t know either. If I worked here, I’d be hoarding the mac and cheese in a back room like Gollum from Lord of the Rings. Once I was done, I debated on dessert and decided against it. I was really full and I knew I had to somehow manage to walk back to my car. I was really pleased with Lulu’s not just because the food was great, but also because of the welcoming service I received. This is a great little addition to the grove and one the grove desperately needed. The side walk café appeal is great for people watching in the grove, but if you’re interested in indoor seating be sure to call ahead since there is limited seating.